The soon-to-be 40 year old is coming off the worst postseason of his professional career, scoring just one goal and adding six assists in nine games. He saw his role diminish from a top six forward, to playing 13 or 14 minutes a night in sheltered minutes on the fourth line. The conclusion of this season saw him finish out a four year contract for $22.5 million, with a cap hit of $5.625 million for the 2014-15 season. With his career obviously coming to a close soon, you couldn’t blame him if he was trying to maximize his profits and try to get the best deal possible for him. If St. Louis’ is looking for a contract similar to this year’s cap hit, then the Rangers need to part ways with the future hall of famer. But if St. Louis is willing to take a contract in the $1-2 million range, then why not resign him? The Rangers have a lot of free agents, restricted and unrestricted, to re-sign, and not a lot of cap space available to address these needs. Derek Stepan and Carl Hagelin are the two biggest names, with both players expected to get raises. Matt Hunwick, JT Miller and Jesper Fast are some of the other notable players that will require new deals. 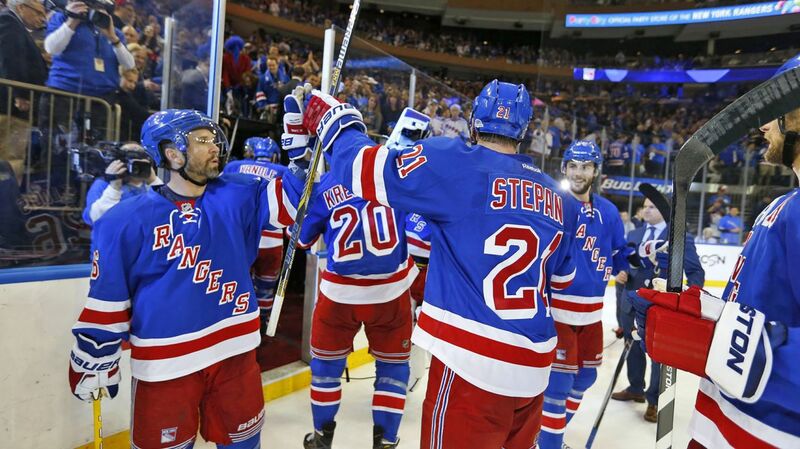 Derek Stepan is one of the Rangers that will get a nice pay raise, and an important part of New York’s future. Photo courtesy of MSG Photos. Derek Stepan’s current cap hit is $3.1 million, and he is making $3.85 million this year. He could easily see a pay raise over the $5-6 million mark, with Stepan establishing himself as a potential top center this season. Carl Hagelin currently has a cap hit of $2.25 million, and could see a raise of $500,000 or more. St. Louis is simply not as much of a priority as Hagelin and Stepan are to the Rangers’ future. 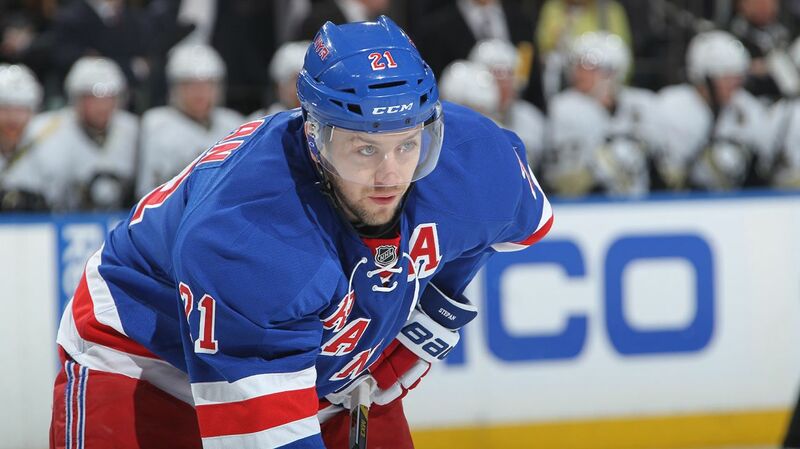 Stepan and Hagelin are younger, and will continue to help the team further down the road. However, like others, I don’t think the Rangers should just throw him out without making an attempt to sign him for a bargain deal. St. Louis has said in the past that he wants to retire a Ranger, and would like to stay closer to his family in Greenwich, Connecticut. Although he showed his age in the playoffs this year, let’s not discount his importance during the run to the Cup Finals in 2014, as well as during this regular season. St. Louis started the year playing center while Derek Stepan was injured, a position he had rarely played in his career. When everyone was healthy and St. Louis was back to the wing, he did play pretty well, and finished with 52 points in 74 games. He was tied with Chris Kreider for second on the team in goals, and finished third on the team in assists (31), behind only Derek Stepan and Derek Brassard. I’m also a big believer in intangibles. St. Louis is a tremendous leader on the ice and in the locker room, and many players look up to him for guidance. He’s a mentor to the younger players like Kevin Hayes and Chris Kreider, imparting his years of valuable experience and knowledge to them. And remember how the team rallied around him after his mother passed away during the series against the Penguins? He’s a crucial part of that locker room and leadership group. He’s a hard working guy, and his contributions go far beyond his on-ice production. 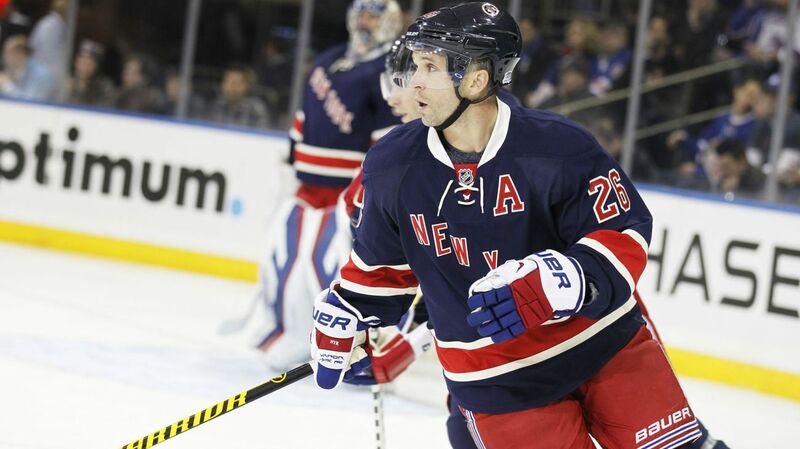 Martin St. Louis is a huge part of the Rangers’ leadership, and a mentor to the young kids. His importance goes beyond his on-ice production. Photo courtesy of MSG Photos. If the Rangers and St. Louis can agree on a cheap deal, and if St. Louis is willing to take that pay cut to stay a Ranger, than I see no reason why he could not be an affordable, productive third line winger. While mentoring Kevin Hayes and other youngsters on his line, I think he could be a 20 goal scorer again, and a solid player. But if Sather can’t agree to a deal for $2 million or preferably less, then it’s unfortunately time to part way with the veteran winger. His production and possession numbers simply aren’t good enough to justify a bigger salary. The money needs to go to the younger free agents that New York needs to lock up. In an article from FullTilt NYR, Anthony Scultore suggests that the Rangers may want to keep St. Louis in the organization with the Hartford Wolf Pack. That would keep him very close to his family, and would allow him to continue to mentor the Rangers’ young players, something that he really enjoys doing. Perhaps a future of coaching or a role in management. It seems as if Vigneault and Sather do want him to stay. Vigneault counts on him to be a leader and a top player, and places a lot of trust in him. It really isn’t an easy decision to let Marty walk, despite the shared opinion of many Rangers bloggers and writers. The Rangers should try and keep him in the organization in some way, whether as a player or in coaching or management. If it’s as a player, the price has to be right. Posted on June 9, 2015, in In the Crease and tagged Alain Vigneault, Hartford Wolf Pack, Madison Square Garden, Martin St. Louis, MSG, New York Rangers, NY Rangers, NYR, Rangers, Rangers Nation, Rangers Player Grades, Rangerstown, St. Louis, The Garden, Will Martin St. Louis be a Ranger, Will the Rangers re sign Martin St. Louis. Bookmark the permalink. 1 Comment. MSL is a future HOF-er. His time has passed and he will be taking up a roster spot that can and should be filled by a young player. Keeping him in the organization with the Pack is a tremendous idea. He can be an excellent mentor for our kids. But as far as a NYR, sorry I feel he shouldn’t be resigned at any price.